The main attraction is the house itself and you do get to see quite a bit of it on the tour. The audio guide helps to explain the significance of each room, although it was a bit too ‘art’ orientated for our liking. The state rooms are resplendent and room after room is striking in its own way. Our favourite bit of the house was the beautiful hallway with the sweeping staircase – just lovely. On the way out, you’ll see a sculpture gallery with lots of busts – look out for one of Mr Darcy from the film of Pride and Prejudice which was partly shot here. 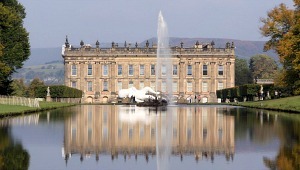 Chatsworth is presumed by many to be ‘Pemberley’ from Jane Austen’s book. In the former stables courtyard, you’ll find the food and shopping outlets. The shops stock a range of quality goods for the home and garden and there’s also a mini-version of the Chatsworth Farm shop called the pantry. We’d recommend a trip to the actual farm shop if you have time though as it’s a delight for the senses. For food, there’s a waiter service area, but most visitors use the Carriage House restaurant instead. Although the food quality of the meals you buy is good, sadly we’ve found lots of other things let it down. The prices are a little steep for a self-service restaurant, for example, on our last visit we paid £8.50 for 3 sausages with veg. However, both the meals we had were not warm. In fact, to call them tepid would have been generous. Not good. You do get to sit in the converted Carriage House however, which is a nice place to eat….if your food is hot. There’s no doubt that there’s loads to do at Chatsworth and it can easily occupy your whole day. You just need to bear in mind that the main attractions all have separate admission fees, so if you do everything it can end up costing an average family a small fortune. There is a ‘complete’ ticket though which costs £19 for adults (2013 prices). It’s worth remembering that all tickets booked online get free car parking. There are some things you can do at Chatsworth which don’t cost a lot of money though. We’d recommend paying the £3 parking fee (2013 prices) and just walking around the park a little which is free. Top of our list would be a walk in Stand Woods – the entrance is by the farmyard. If you follow the tarmac path and follow the small yellow signs that say HT, you’ll eventually come to the Hunting Tower which has a great view over Chatsworth and the park. The tower is also older than Chatsworth House itself! Along the way, you’ll also see the most incredible water feature which includes waterfalls, and streams. The second place worth walking to is the village of Edensor, which was built to houses to Chatsworth workers. It’s very pretty and in the churchyard look out for the grave of John F Kennedy’s sister, Kathleen Kennedy who became Kathleen Cavendish, Marchioness of Hartington. Chatsworth is open everyday until just before Christmas from 11am until around 5.30pm for the house and 6pm for the gardens. The farmyard is open from 10.30am to 5.30pm.